Some things surprise you. You know…surprising things. Like how easy these tomatoes are to make. But not how quickly they disappear. This method is about enhancing the natural perfection of even plain-old grocery store non-organic tomatoes, and it’s surprisingly simple. The technique is the most important part here, not the exact steps. When you apply low and slow heat to tomatoes, they caramelize and the flavors you put on them concentrate. You end up with slightly chewy, savory-sweet little rubies that you’ll have a lot of trouble not eating. 1. Tomatoes: Get all the tomatoes to the same size. I sliced them in half lengthwise, and some of the larger ones in quarters. 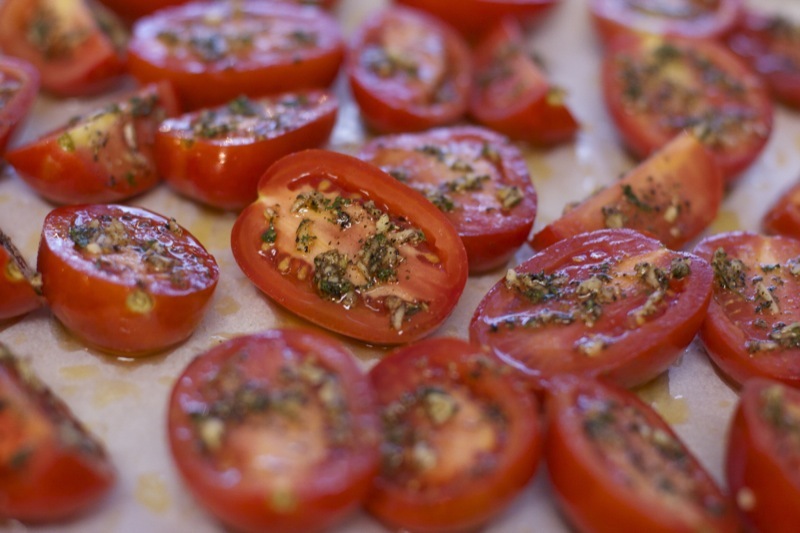 Spread parchment paper on a big sheet pan , olive oil it, and spread all the tomatoes out. 2. Flavor: I made these with classic Italian flavors. For one sheet pan of tomatoes, I finely chopped two cloves of garlic, added generous pinches of whatever dried herbs I had in my pantry, and added olive oil until it made a paste. I rubbed this paste over each of the tomatoes. You don’t need to salt them, but if you don’t put any extra stuff on top, just drizzle plain olive oil on top (or toasted sesame oil, or flavored olive oil). 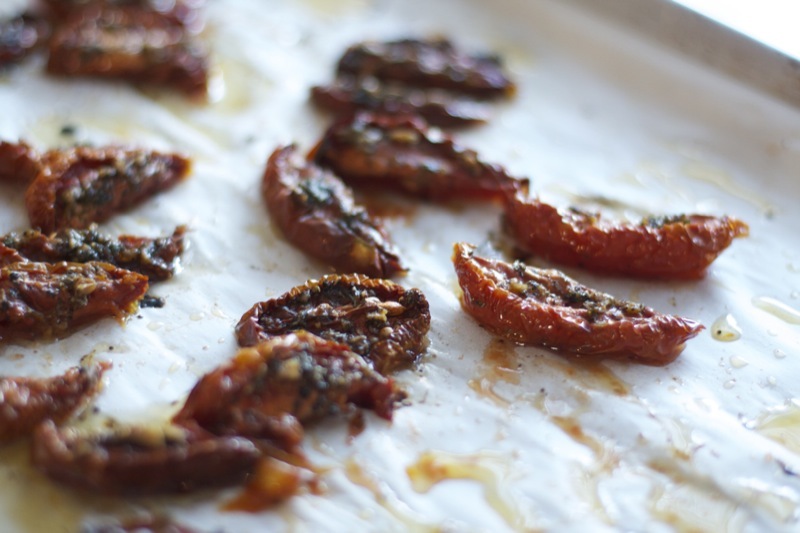 Now, just think of the possibilities here – Chipotle oven-roasted tomatoes. Thai red curry and basil oven-roasted tomatoes. You really don’t even need any extra flavorings at all and could just let the slow-roasted tomato flavor shine alone. 3. Roast: Heat the oven to between 200 – 225F. Some recipes I read said to let the tomatoes sit in this low oven for ten hours. But, I didn’t have ten hours because I started in the evening and didn’t want to leave the oven on all night. I left the tomatoes into a 225F oven for about four or five hours, and then turned off the oven, did not open the door, and left them in the warm oven for another six to seven hours. This worked just fine! If by morning, the tomatoes are not sufficiently dehydrated, just put turn the oven back on at 225F for an hour. Smaller tomatoes (like cherry or grape) will take half the time of Roma tomatoes. 4. Uses: Pasta. Rolled into a chicken breast. Diced over mashed potatoes or hummus. On a pizza. On some crusty bread with ricotta. Or….straight out of the oven into your mouth. I.May.Have.Done.This. To store: Put them into a glass jar or other non-reactive container and top with olive oil. Store in the fridge. congratulations! Your blog is beautiful and Molly is adorable. Looking forward to trying the tomatoes. Yummy! Hey lady! Hope life is going well. Your blog is awesome!